In a time long, long, long ago lived a man. His spirit was cursed after he made one too many bad jokes, and silly puns. As punishment he was pushed into the life of servitude. Who knew poor punch lines could land you in such a bad place! The man who now is a genie waits for you to climb through the sands of time to find him. And, as the story goes, he will be found by Aladdin. However, you may find him too. Be careful as wishes don't always turn out as they seem. This genie loves to play word games. The last person who rubbed his lamp asked for a great love. Of course, the genie asked the man, "Do you love cheese?" Without hesitation the man said, "Yes." and suddenly the man was holding a plate of grated cheese. Good joke, but a tough waste of a wish. The genie simply justified not understanding the difference between grate and great. He really just wanted to return into his lamp and make a pizza. You can be just like the tricky genie in the Adult Sultan Costume. 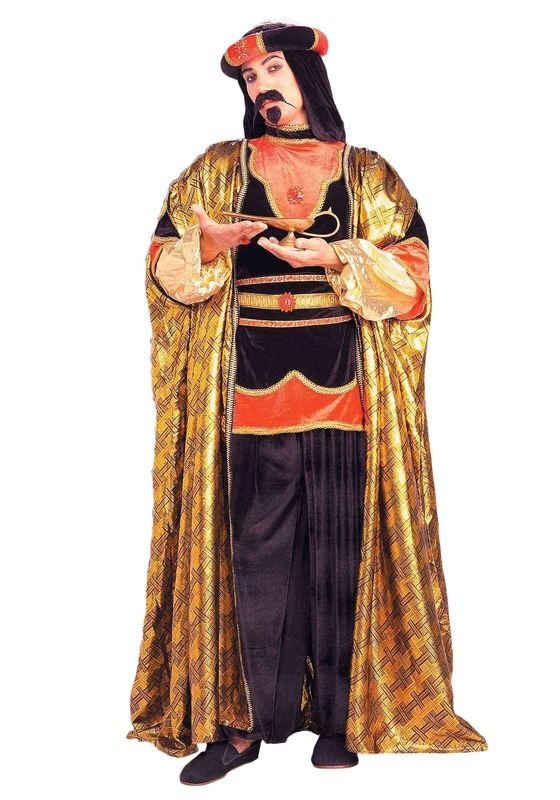 The costume includes a gold trimmed tunic, and velvet like pants. To adorn the waist a jeweled broach, and to top off the look a royal headpiece. Whether you are dressing up as the evil Jafar, just going for an Arabian sultan look, or being a tricky genie the night will be magical in the Adult Sultan Costume.